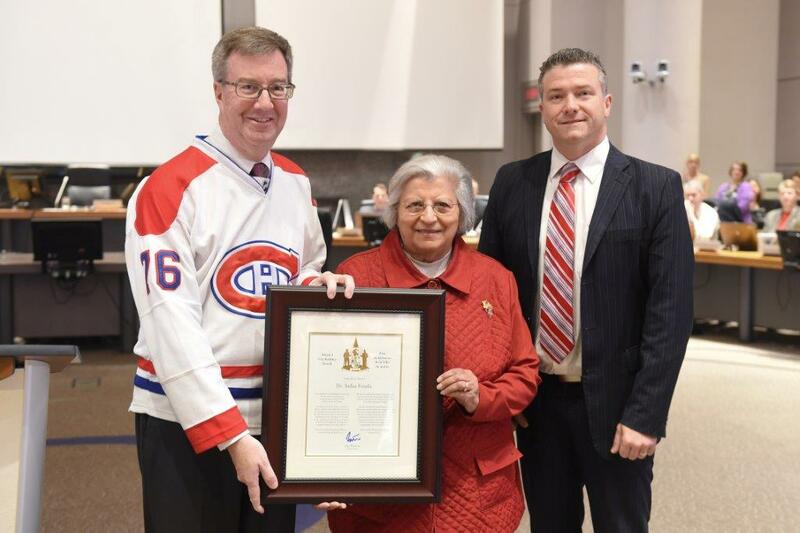 Ottawa –Mayor Jim Watson and Beacon Hill-Cyrville Ward Councillor Tim Tierney presented the Mayor’s City Builder Award today to Dr. Safaa Fouda for her volunteer work in bringing together Canadians and new immigrants, as well as all kinds of faith groups, with the goal of promoting mutual understanding and compassion. Dr. Fouda is a pioneering female engineer who moved to Canada from Egypt in 1969 and holds a Ph.D. in chemical engineering. She retired in 2005 as Deputy General for the CANMET Energy Technology Centre, Natural Resources Canada. During her career, she volunteered in a broad range of advisory committee roles with various federal government departments, the Police and RCMP, as a consultant on the tenets of the Muslim faith, and as a presenter in the interfaith community, consistently with respect to helping immigrants to integrate into and serve their new community, and to promoting shared respect and common values. After she retired, she became more involved in philanthropic and community work with an interest in helping vulnerable communities and in cross-cultural bridge building, peace-building, Muslim/non-Muslim relations, supporting human relief, education and advocacy for justice and human rights. She contributes finances and volunteers with numerous NGOs that focus on these causes. She has received several recognitions including the Queen Elizabeth II Diamond Jubilee Medal and Ontario’s “Leading Women Building Communities” award.